There are over 50,000 species of Ostracods also known as Seed or Mussel Shrimp. Most Ostracods live in sediments at the bottom of oceans or lakes, others are Zooplankton. Some species are found in moist terrestrial habitats. They grow from 0.1 to 32 mm in length. Their bodies are flattened from side to side and protected by a bivalve-like valve or "shell" which they replace with each moult . The body consists of a large head and a small thorax without distinct segments. They have the five pairs of appendages on their head but only 1-3 pairs of appendages on the rest of the body. They use two pairs of well-developed antennae to swim. Most species have no gills, heart or circulatory system. Some species have a single eye and others two eyes but their major sense is touch provided by sensitive hairs on the body and appendages. Male ostracods have two penises and the females have two genital openings. The individual sperm are coiled up within the testis and, in some cases, when uncoiled the sperm can be up to six times the length of the male ostracod itself. Mating usually occurs during swarming, with large numbers of females swimming to the join the males. In most species, eggs are either laid directly into the water or are attached to vegetation or another surface. In some species, the eggs are brooded inside the shell. The eggs hatch into nauplius larvae which already have a hard shell. Many freshwater ostracods reproduce asexually by cloning themsleves. 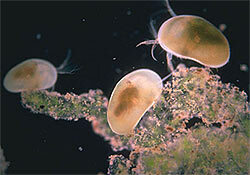 Ostracods can be carnivores, herbivores, scavengers or filter feeders. Some predatory Ostracods attack their prey in groups so that they can eat animals much larger than themselves. They have many predators especially small fish. Some ostracods have a light organ which make light-producing chemicals. Most use the light as defence against predators and a few species use the light for mating. the light source. 10X lomo objective, oblique darkfield lighting, prime focus.